Sean and Mary Hamilton welcome you to the Blackberry Restaurant. Situated in the center of the picturesque village of Leenane overlooking the beautiful Killary Harbour, the Blackberry Restaurant is the ideal venue for you and your friends to experience great cuisine... from a light lunch to a full evening meal. The Blackberry Restaurant prides itself on the freshness of the locally sourced produce used in its kitchens. Seafood caught fresh from nearby waters and quality Irish meat is married together with local vegetables and home baked bread creating a menu that is guaranteed to delight. "Sean and Mary Hamilton’s lovely little restaurant is just what the weary traveller hopes to happen on when touring or walking in this beautiful area. They’re open through the afternoon and evening every day during the summer, serving reliably good food: home-made soups and chowders with home-baked bread, substantial snacks such as fish cakes and mussels, and delicious desserts like rhubarb tart and lemon meringue pie with cream. Extra dishes such as hot smoked trout and a chicken main course might be added to the menu in the evening, but the secret of the Blackberry Café’s appeal is that they don’t try to do too much at once and everything is freshly made each day." 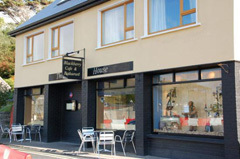 Offering unrivalled views of the Killary Fjord and the rugged mountain scenery of Connemara, the Convent Guesthouse is ideally situated for your Connemara vacation.Centrally located in the picturesque village of Leenane, you are a short stroll from local pubs, restaurants, shops and facilities.